The west side of LA is becoming more bikable every day. 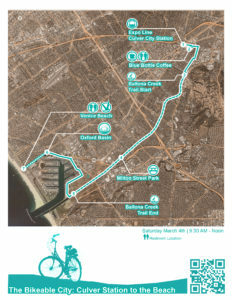 The increasing popularity of the Expo line, Ballona Creek Bike Trail, and Venice Beach Promenade, as well as private developers and public agencies leveraging proximity to major population centers are in sum transforming the west side into a mecca for cyclists. Come join us on March 4th at 930 AM as we experience some of the most interesting and catalytic recent improvements to our “Bikable City”. Culver Station: One of the Expo line’s most important stations, MTA is investing in bike amenities connected to Culver station, most specifically a Bike Hub. Hear from a representative from MTA about the latest plans for this important program for cyclists. http://bikehub.com/metro/. Ballona Creek Bike Trail: built in the 1930s as a service road for maintenance vehicles along Ballona Creek, the trail was striped for public use by cyclists, joggers, walkers and skaters. Significant bike path improvements include native landscaping, artist-designed gates, benches, drinking fountains, murals and other projects undertaken collaboratively by various public agencies and local non-profits. Milton Street Park: the approximately 1.2-acre linear park is highlighted by green-design elements such as recycled building materials, native foliage and flow-through planters. Other features include a bird-watching platform, informational signage, outdoor seating and picnic areas. Oxford Basin: designed to enhance flood protection and reduce stormwater pollution while significantly improving the quality of the ecosystem, the project provides new public recreational and safety amenities, including an illuminated walking path, observation areas and educational signage. Nate Cherry FAIA AICP LEED AP BD+C (CallisonRTKL) leads the Los Angeles Planning and Urban Design studio of a multidisciplinary international design practice. His team focusses on significant creative and sustainable districts in major municipalities, with ongoing work in Los Angeles, Phoenix, Las Vegas, Denver, San Francisco, Honolulu, HI, and Calgary, CN. Ying-yu Hung (Managing Principal, SWA) and Trent Okumura (Associate, SWA) are responsible for the design and execution of Milton Street Park, working closely with the client, MRCA. Ying-yu and Trent shepherded the project through a complex matrix of permitting and construction, as this is the first public landscape project to be built atop the infamous storm channels of the city of Los Angeles. Erin Mavian (Runyon Development) : Through her extended experience advising global brands and agencies, Erin is able to identify and translate the value of experience, design, digital culture, sustainable thinking and social movements into creative realities for the consumer. In her current role as COO at Runyon Group, Erin is responsible for driving the Platform brand and experience in addition to leveraging strategic partnerships and opportunities for the business. Georgia Sheridan AICP (LA Metro) Transportation Planning Manager at LA County Metro where she oversees transit corridor studies and reviews the design of future rail stations. Ms. Sheridan has experience working in the both the public and private sector, focusing on the intersection of transit, urban design, and development. She teaches a graduate course on Visual Communication at UCLA, has written for APA LA, Planetizen and Next American City, and is a frequent speaker at planning conferences. Joshua Svensson P. E. (LA County Watershed Management Division).